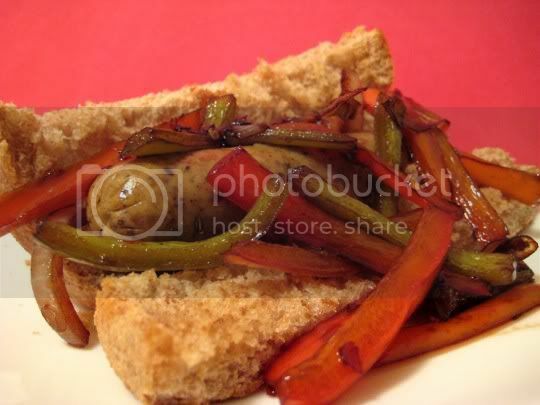 Although this is heavily adapted from a non-vegetarian recipe for the grill, the veggie version of these sausage sandwiches is amazing! And boy are they spicy, and boy are they sweet. Red and green bell peppers and onions are mixed with dried chili flakes (halve the amount if you're afraid of the heat), maple syrup, and balsamic vinegar, then grilled (well, I sauteed my veggies first, then added the liquids and simmered until they were almost cooked off). Next, Italian sausages (I used the Morningstar Farms version) are grilled, placed on a buttered and grilled bun, and topped with the pepper mixture. Easy to make and super quick, you'll have an addictive, flavorful meal in minutes! I would say the pepper mixture is the star of this recipe, but the flavors go so wonderfully with the spice-filled (chockful of fennel seeds, that subtle licorice-flavored spice that goes so well in Italian dishes), savory sausages that it's really a toss up. And don't forget the butter! It seems like a small addition to the bun, but it really enhances the crispiness. The pepper mixture makes enough for about 2-3 sandwiches, but if you have any left over, don't worry because it'll still taste great the next day! And trust me, you'll be wanting to eat these again. Make again? Definitely! And I'll have to try the grill method at some point. I was out of maple syrup so instead of the marinade I used Asian chili sauce that I had in the fridge. When everything was done I tossed the onions and peppers in chili sauce for 30 seconds.Its a sweet spicy sauce that was soooo good on the onions and peppers.